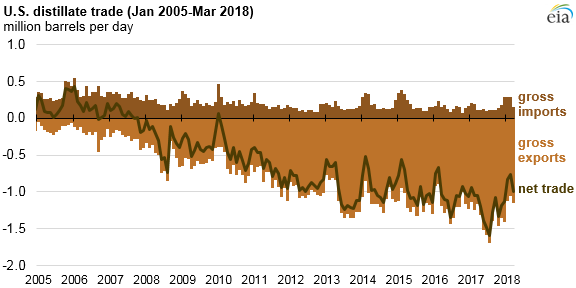 Distillate fuel continued to be the most exported U.S. petroleum product in 2017, averaging 1.4 million barrels per day (b/d) of gross exports. U.S. distillate exports went to 79 different destinations in 2017, particularly to markets in Central America, South America, and Europe. The proximity of U.S. Gulf Coast refineries to Mexico and to Central and South America combined with high demand in these regions led to higher U.S. distillate exports to these locations. 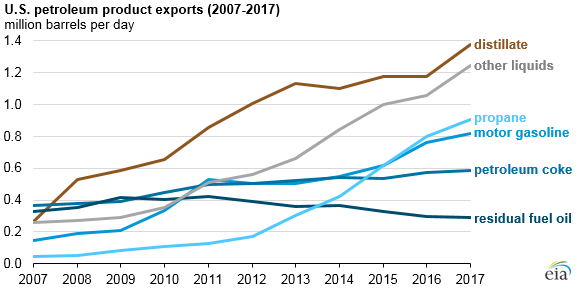 In 2017, the United States exported 27% of total domestic distillate production, continuing years of increasing exports and relatively flat U.S. consumption growth. Because domestic distillate demand is highest in the winter months, U.S. distillate exports tend to be highest in the summer months. In February 2017, however, warmer-than-normal U.S. temperatures coupled with colder-than-normal European temperatures led to above average winter exports of distillate, especially to markets in Europe. Distillate exports from the United States set consecutive record highs in May, June, and July 2017, reaching 1.7 million b/d in July. In August, exports of distillate fell to 1.4 million b/d, partly because of the effects of Hurricane Harvey, which temporarily disrupted shipments of distillate and other fuels from the U.S. Gulf Coast. Unlike motor gasoline, which is used almost exclusively for transportation, distillate fuel has a variety of uses, including as a heating fuel in homes and businesses, as a fuel for certain industrial processes, and as a transportation fuel for both light- and heavy-duty vehicles. The U.S. Gulf Coast (Petroleum Administration for Defense District 3) is the largest petroleum refining region in the country, accounting for approximately half of the total U.S. refining capacity in 2017. 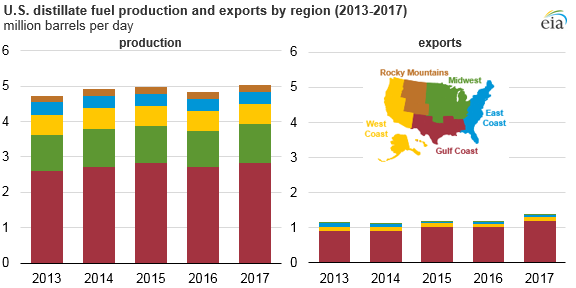 Distillate production on the U.S. Gulf Coast exceeds regional demand, making the region a net supplier to other U.S. regions and foreign markets. In 2015, refineries in the region produced 2.8 million b/d of distillate, while regional demand was about 800,000 b/d. The Gulf Coast accounted for 87% of U.S. distillate exports in 2017.